Nastiest motel ever. Motel 6 at 7707 Lee Highway, Chattanooga. We only stayed here because it’s where our youngest daughter’s rowing team was staying. I have low expectations when it’s this cheap — you can expect thin, rough towels that they are stingy with. Ditto for the cheap mattress and thin pillows, plus the use of an exterior stairway instead of an elevator. I was even fine with expectations of thin walls and noisy kids (who were surprisingly quiet, though). I hoped they would have a hair dryer as I didn’t pack one, but I was philosophical when I saw that they did not. But check this out for Room 215. The floors LOOKED clean. But this morning after my shower, I dried off, got mostly dressed and put my makeup on. When I went to put my socks on, the bottoms of my feet were BLACK. Ew, ew, ew. 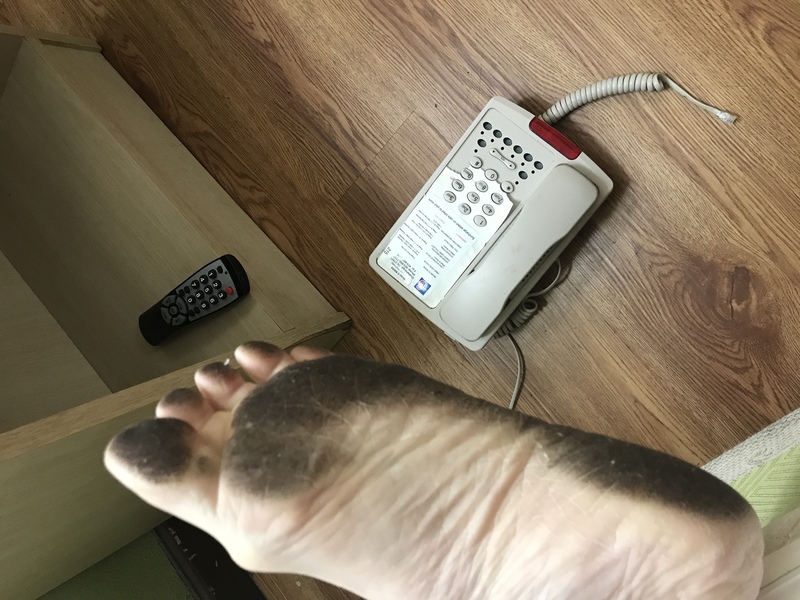 I’m not a clean freak and I’ve certainly had dirty feet before, but that was GROSS. No trash can or bag. No spindle in the toilet paper holder. Husband couldn’t completely lift the toilet seat because the toilet tank leaned over onto it. Probably close to a dozen cigarette burns on the edge of the tub. 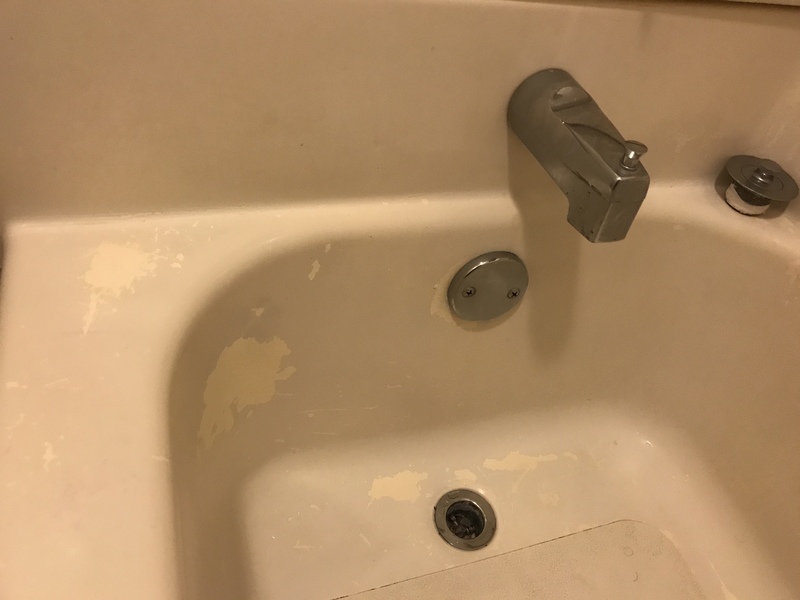 A partially peeled off paint job on the tub. 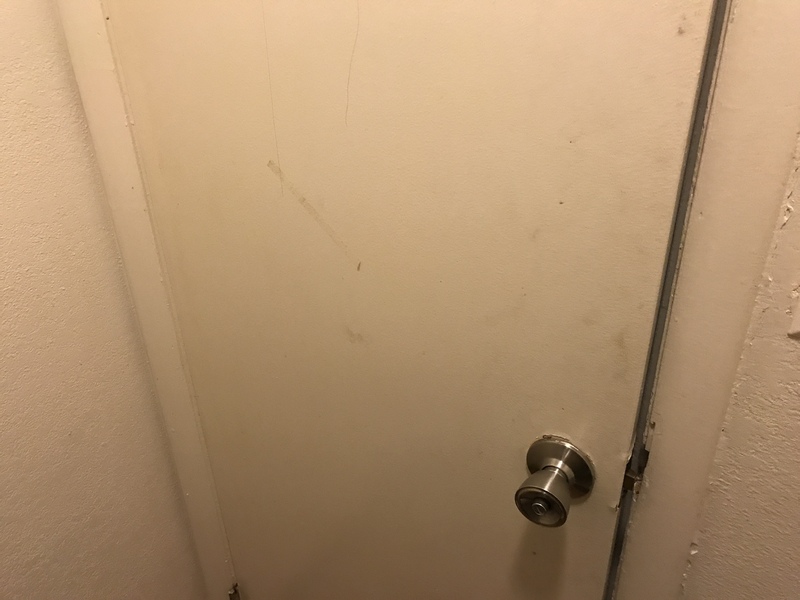 A busted doorjamb on the bathroom door so you couldn’t even click it closed, much less lock it. 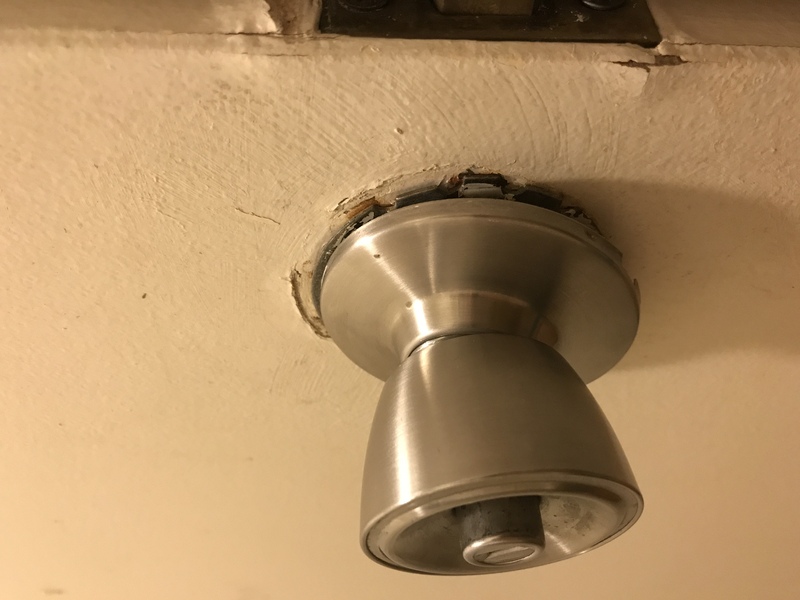 The bathroom doorknob was hanging loose. The bathroom door (back side) was FILTHY. One electrical outlet was either partially burned on had some dried opaque stain. I didn’t check closely. Cigarette burns in the blanket and on the bedspread. Curtains were half off the rod and had cellophane tape on one end and what appeared to be nail holes along the edge of the other side. 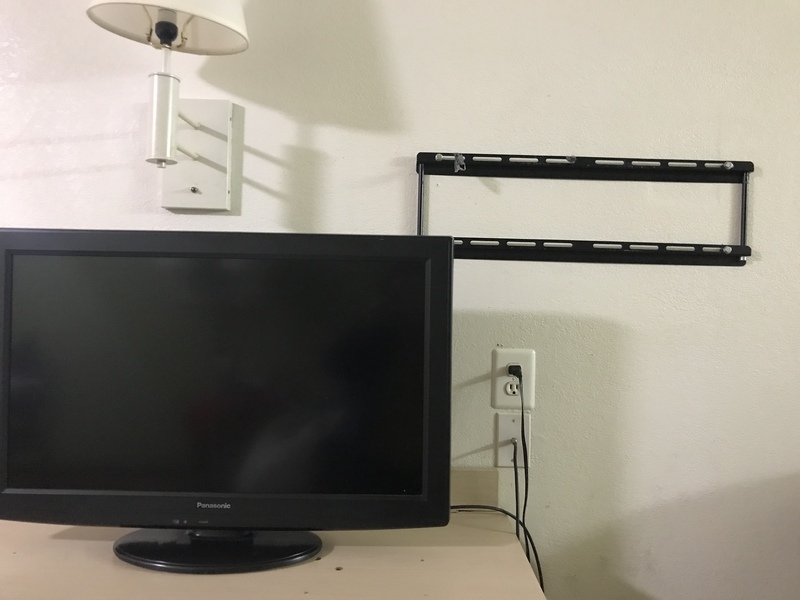 Not a big deal, just ugly: The old TV mount was left on the wall when they installed another TV on the dresser. 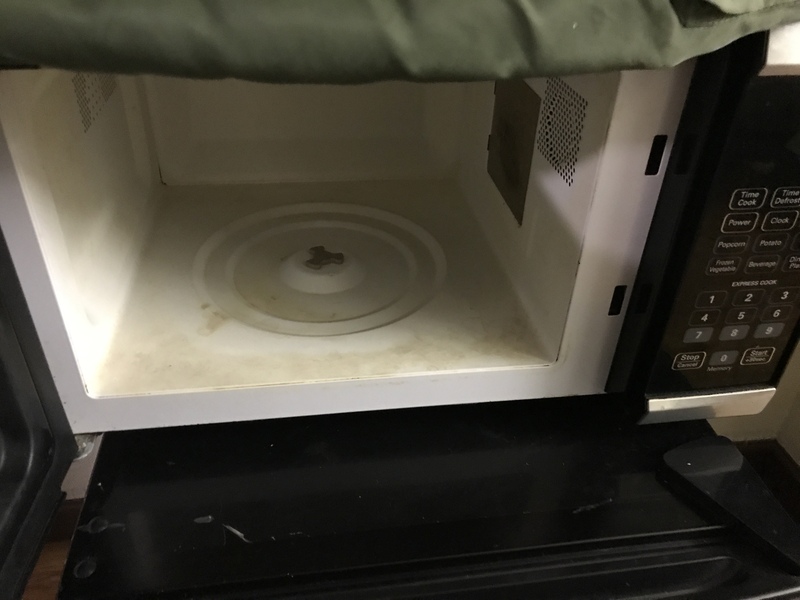 Inside of the microwave wasn’t throughly wipes out. The door and wall next to it had clearly not been wiped down in a LONG time. Not in my room, but one of the kids on my daughter’s team reportedly picked up the remote control in her room and a few bugs came crawling out. Our daughter’s room had no heat. Oddly enough, this hotel was OVERBOOKED and out of other rooms. We were tired and it was late, so we stayed anyway. I pulled bedding off and checked for bedbugs but I didn’t see signs of them. 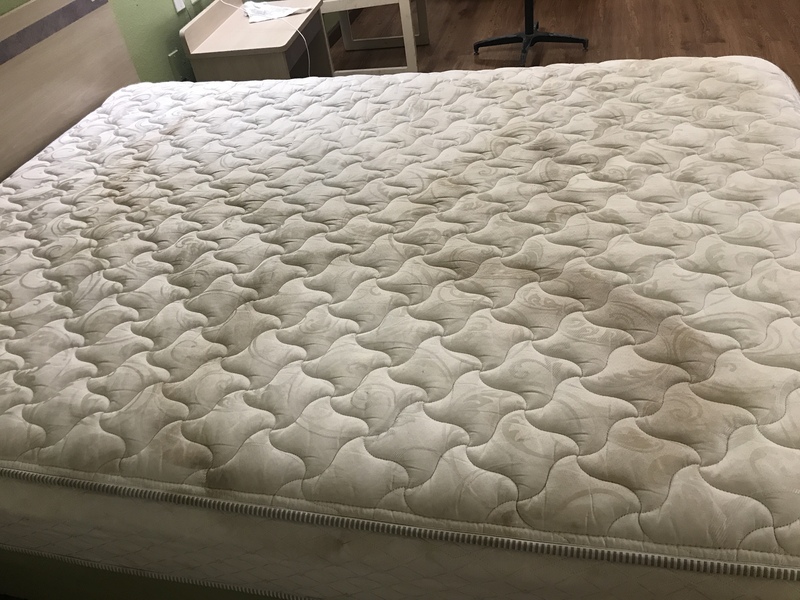 The mattress was seriously stained though. For my peace of mind, I’m glad I had no black light to check for stains on the blankets. And it makes sense that the room number on the wall next to the room’s door had Braille on it. The blind are probably the only reason this hotel has a two- or three-star rating (depending on where you check). Our room smelled strongly of fragrant pipe tobacco (not smoked, just the tobacco). That actually didn’t bother me. Made me think of my maternal Papaw. At least they had no bedbugs, and there was a fart fan in the bathroom. Fancy. I’ve been pretty happy with the clothes my Dia.com stylist picked for me the past couple of months. 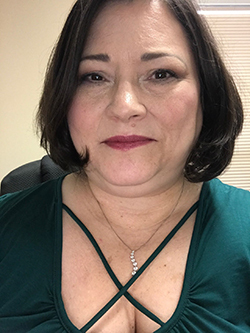 We’re still getting to know each other, so I’ve had a few returns, but she’s also found some things within my budget that delight me — no easy feat when you’re plus-sized. A denim jacket I just couldn’t say no to, and I cannot wait until it’s cool enough to wear it. A soft “vegan leather” clutch purse in a neutral shade of wine/brown that goes with everything. A navy blouse with a super flattering neckline. A gorgeous white linen blouse that was perfect in every way except for how the front buttons gapped across the bust. That would drive me crazy to have to use double-sided tape to keep that shut. Also, I know I’m too damned lazy to iron linen regularly. So I sent it back. With a lump in my throat! I haven’t found a summery maxi dress from them yet. Both they have sent me are that cheap-feeling double-knit polyester, and y’all, I have already lived through the ’70s once and don’t intend to do so again. (It’s kind of odd, because every other single thing they have sent me has been really high quality material and well-made.) Mostly, I didn’t like the loosely gathered waists. I’m just too big for that. I need an empire waist or no waist. I haven’t taken any photos of me in my Dia clothes yet, but you can see some other Dia customers in their new duds over here: https://www.dia.com/gallery. SPECIAL REQUEST & FULL DISCLOSURE: If you decide to check it out, please consider using this link — I get a little kickback if you give them a try: https://www.dia.com/r/1i3e4. Thanks!